Almost two months there are no news about the modification. But I have nothing to say. At the same time my life is not stand still: a lot of events are happening, wonderful, and not very. A lot of events are happened in my country (as a rule, they are terrible). Modification is not forgotten, but I cannot say about some progress. After I lost that I did during the year (and this was and my fault), desire to develop mod was lost too, and only now it returns to me. Now is not solved the main question — whether I will restore data on broken drive, or not. Because price on restoring data is too huge and this very risky in terms of the safety of personal data. I or back year of work (back the data) or recreate all (in a shorter time) and catch up. I will tell little about restoring of data. In my country this work can make only one firm (we have also few small firms, but only this big one have some reputation and years of experience). So, I have an idea to organize some kind of сrowdfunding project on the site, and users, if they want, can donate to restore data, and, in future, maybe even on new functions in the mod. But about this I will write later; already started a new pool, where you will vote for your opinion. 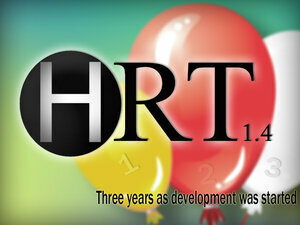 September 22, 2011 was announced HRT 1.4 and this day I (for convenience) consider as day, when the development was started. Three years as mod in the development! I think, this is too much for the mod. Even big games are made faster (from another side, on the games work big teams of professionals). All this and good, and a bit sad. Anyway, I'm interested to make mod as soon as possible and 2015 will be a final date. September 27, 2010 was released first HRT mod; full name — San Andreas HRT Pack (v1.0 LV). HRT (HRT Pack) series lasted four years. Everything started in 2010 when I returned to a little hobby and started to make mods for GTA, I remade textures and released them as little mods, then I decided to collect that mods into one pack, HRT Pack 1.0, that weighs only 80 Mb. You can download this rare first version here, recently I add (just for order) English instruction. It is unlikely that I then thought that I would have few years to work on this project, but I continued work and last mod from old-gen series — is HRT Pack 1.3: EE.